POKHARA, Jan 20: The departmental team Armed Police Force (APF) Club has won the second Speaker’s Cup National Volleyball Tournament with a 3-1 set win over the other departmental team Nepal Police Club in Pokhara on Saturday. At the Pokhara Stadium, APF has been successful to defend the title with a commanding win. With the title win, APF has been rewarded with Rs 350,000, while the runner-up Police took home a cash prize of Rs 175,000. APF dominated the first set winning the set 25-8, while Police made a spending comeback in the game winning the second set 25-19 to level the score to 1-1. But, APF won the third and the fourth sets and gave no chance to Police to make a comeback. It won the sets 25-17, 25-17 each. Earlier, for the third-place match played at the same stadium, Province 3 defeated Gandaki Province 25-14, 21-25, 25-14, 25-17. This is the seventh title APF has won in the 2018-19 season among eight it has played. 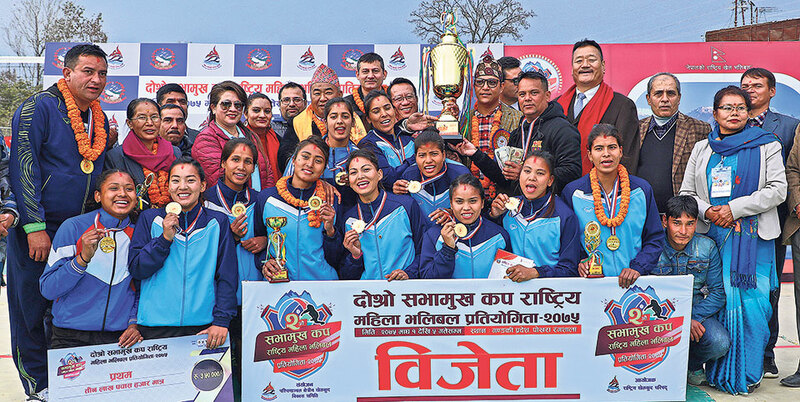 APF had earlier won Sher Bahadur Women’s Volleyball Tournament, Teej National Women’s Volleyball Tournament, New Diamond Cup National Women’s Volleyball Tournament, NVA League, 22nd National Women’s Championship and first Speaker’s Cup tournament as well. Whereas in the Aadi Awadi Tournament, APF lost to Chitwan Tigers. 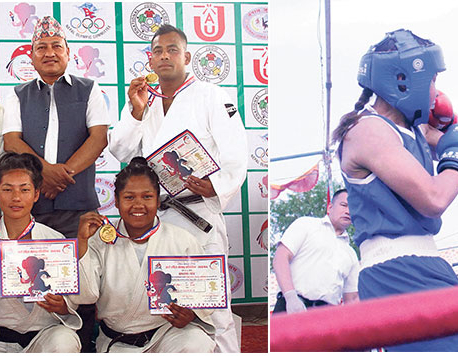 Third-placed Province 3 won Rs 100,000, while Gandaki got Rs 50,000 for finishing fourth. Pratibha Mali of Province 3 was named the best spiker, while APF’s Hira KC got the best blocker award. Likewise, Police’s Kamala Pun and Shanti Tamang won the awards for the best setter and the best libero respectively, and Aruna Shahi of Gandaki got the prize for the best server. APF’s Gyanendra Bista was named the best coach of the tournament. They all got Rs 5,000 each. Likewise, APF’s Saraswati Chaudhary was adjudged the best player of the tournament and was rewarded with Rs 10,000.